Fans of Latin Jazz may have a new favorite CD for their collection. Mark Weinstein’s latest exploration is entitled Con Alma, and features the brilliantly creative work of Mark Levine on piano, bassist Santi Debriano, and percussionists Mauricio Herrera, and Pedrito Martinez. Weinstein’s work on multiple flutes is impressive to say the least, and the line up of tunes is a study in compositional mastery. Con Alma epitomizes the mature handling of great jazz blending the rhythmic, harmonic, and energetic stylings of Latin and African influences. Starting with the first song “Santi’s Africaleidescope” by bassist Debriano, creativity abounds in the writing and soloing of the CD. “Broadway Local” is a Weinstein original, and flows smoothly through a river of great soloing. Dizzy Gillespie’s “Con Alma” steadily grooves and highlights more of Debriano’s solid playing. Coltrane’s “Crescent” begins slowly giving way to a lively Latin beat, over which Weinstein and Levine contribute beautiful solos. Wayne Shorter’s “Fee Fi Fo Fum” is given the Latin treatment and highlights the percussive prowess of Herrera and Martinez. “Evidence” by T. Monk is rhythmically complex, but again, the soloing here is outstanding. Levine contributed “La Coneja Loca”, and it speaks volumes of the pianist’s style and taste. Weinstein plays bass flute on the Bobby Hutcherson composition “Gotcha”, and creates a great effect when doubled with Debriano’s bass. “Soul-Leo” is by the amazing Mulgrew Miller, and as if to pay tribute to a fellow pianist, Levine takes a very tasty solo. “Monte Adentro” by Valle, and Victor Young’s “Stella by Starlight” round out the CD, and offer more great soloing particularly by the Herrera and Martinez. 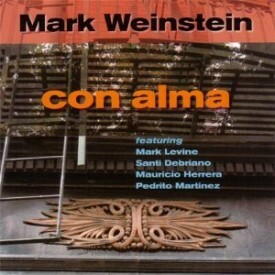 Con Alma is one of many Latin tinged contributions by Mark Weinstein. 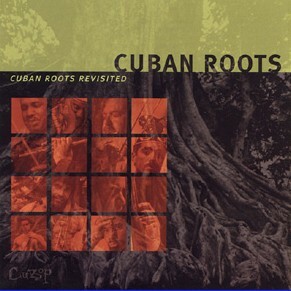 His history with Afro-Cuban music goes back to 1967 with his Cuban Roots album, and more recently Cuban Roots Revisited from 2001, and many more. Weinstein is the real deal and has once again called on some of the finest musicians to make a truly fine collection of Latin jazz winners. Highly recommended. An interesting collaboration of mainstream & jazz classics delivered by a master flautist. It’s mind boggling to realizethat there are so many consummate musical artists out there. And, I’m sure that for every thousand that performs on the level of a Mark Weinstein, there probably are several thousand more as good or possibly even better. Mark’s artistic feeling & delivery style seems to exist for us on an astonishing variety of levels as he interprets his musical choices. His signature tune ”Con Alma” seems simple in conception, yet it is sophisticated in it’s execution. I can only assume therefore that the universality of what he offers his audience, touches the greatest breadth of his listenership by default. Collaboration lies at the heart of any successful performance – a fact all artists must remember when gathering musicians for a recording. The personnel needs to compliment each other artistically while reflecting a variety of musical backgrounds. The repertoire needs to challenge the musicians and at the same time, they must demonstrate mastery over the material. The ensemble should display a mutual respect for their tradition while pushing it in creative directions. Flautist Mark Weinstein balances all these factors on Con Alma, bringing together a bi-coastal group of musicians with immense amounts of life, creativity and musicality. Weinstein and his group tackle a challenging modern jazz repertoire, adapted into Latin rhythms. The stuttering rhythmic figures of Thelonious Monk’s “Evidence” work well over the double time rumba-like feel. Weinstein provides a fiery solo, blazing through the changes against the drummers’ manic performance. The classic standard “Stella by Starlight” receives a warm and respectful Salsa interpretation. Weinstein takes an extended solo through familiar territory while Pianist Mark Levine explores new harmonic approaches. Bassist Santi Debriano’s bowed solo blends Cachao and Paul Chambers into a mix of rhythmic and melodic invention. Levine explodes into a powerful montuno, opening the door for strong statements by drummer Mauricio Herrera and conguero Pedro Martinez. Wayne Shorter’s “Fee-Fi-Fo-Fum” comfortably rides in a funky cross between Danzon and Salsa. Weinstein’s solo reflects a combination of bluesy licks and rhythmic ideas while Levine adds contemporary melodic development. Martinez and Herrera energetically trade eight measure phrases before Weinstein improvises into the melody. The group organically combines traditional Latin Jazz with swing on Dizzy Gillespie’s “Con Alma.” Both Levine and Weinstein utilize these feel changes to create solid statements until Debriano plays a sensitive solo that connects deeply with the song’s changes. The musicians demonstrate a deep understanding of modern jazz through their inspired performances. Several band members contribute original songs to the album. Weinstein’s “Broadway Local” combines “Giant Steps” changes with a melodic twist and several new modulations. Levine displays his mastery of these classic changes, melting them into an intriguing statement. Weinstein’s breathy tone exposes a flurry of notes, exploring all avenues of the harmony. Levine’s “La Coneja Loca” provides a traditional Cha Cha Cha, with a jazz based piano montuno supporting a rhythmic melody. Weinstein immediately attacks the song with intensive rhythmic ideas and quick runs, inspiring a wealth of response from the drummers. Levine takes a more melodic approach, building from a sparse texture into a full mixture of montunos and harmonic ideas. Debriano and Levine open “Santi’s Africaleidescope” with a subtle 6/8 groove that quickly segues into a rhythmic melody. Weinstein and Levine both deliver inspiring solos before Debriano works his way into the upper reaches of his bass for a melodic exploration of the song. The artists display a strong musicianship on these songs, both as performers and composers. Weinstein also chooses some unique selections that add a different flavor to the album. Mulgrew Miller’s “Soul-Leo” provides the perfect setting for a funky Cha Cha Cha groove, balanced with a bit of swing. Levine, Weinstein, and Debriano all thrive on the feel, playing against it with an inspired vigor. Martinez improvises through the reprise of the melody, pushing the song to an exciting ending. Weinstein starts the soulful groove to Bobby Hutcherson’s “Gotcha” on bass flute until the rhythm section adds a funky feel. He continues into a subtle blues flavored solo, enriched by his instrument’s rich tone. The percussionists enter a double time feel, providing solo space for Martinez until Weinstein returns to the main groove. The group creates an album highlight with their creative exploration of John Coltrane’s “Crescent.” A free improvisation moves into a bolero-esque feel, eventually arriving in up-tempo Salsa. Levine plays a particularly inspired solo here, reflecting a study of both McCoy Tyner and Coltrane himself. He moves a variety of sequenced lines through the changes, building a beautiful melodic statement. The band falls back into free improvisation, ending the song with the slower repetition of the melody. These steps outside standard repertoire reveal the group’s unique influences and daring nature. Weinstein and his musicians successfully bring together the necessary elements that raise Con Alma into a unified display of personality. Levine’s presence brings a West Coast flavor to the recording; the musicians approach the songs with a straight ahead cool that exposes their comfort and control. The repertoire reflects a broad knowledge of jazz – Weinstein and his group cover serious material that lies at the heart of the jazz tradition. At the same time, they establish themselves as composers and active participants in the music’s history. The ensemble utilizes ample creativity in their application of Latin rhythms, always with the best taste. From start to finish, the group commits itself to a serious exploration of jazz and Latin music, finding inspiration both in their mission and the high level musicality between them. Resultantly, Weinstein’s group displays a powerful musicianship throughout the recording that strikes at the heart of collaboration. Weinstein paid his dues as a professional musician in a previous incarnation–as a trombonist in the 60s and 70s, helping to develop the Latin trombone style, while working with the likes of Chick Corea, Cal Tjader, Eddie Palmieri, Tito Puente, Herbie Mann, Maynard Ferguson, Thad Jones/Mel Lewis, Lionel Hampton and Clark Terry. Subsequently, however, he abandoned the trombone, took up the flute, earned a PhD in Philosophy, and became a professor at Montclair State University. Since then, Weinstein has, just for the love of it, produced a number of fine recordings, each one notable for its careful selection of sideman and attention to detail in the researching and choice of material. And they run the gamut of genres, Cuban, Brazilian, Jewish… a breadth of styles many record company executives would frown on. But Weinstein markets his own stuff, with Jazzheads Records, and makes his own decisions. Mark’s most recent offering, released September 4th, consists of Latin-oriented treatments of classic jazz standards along with a handfull of originals. He described the background to the session in an interview with Tomas Pena at EjazzNews, who asked him about his concept, and why he chose this particular group of musicians. Suffice to say that everything works beautifully. Mark Levine was an inspired choice–his piano work is the glue that holds the whole sound together, and he solos with authority. Debriano, Herrera and Martinez understand the material and the genre perfectly; they don’t put a foot wrong throughout the session. And Weinstein carries the melody lines, and solos, with his own unique voice, moving between C, alto, and bass flutes to add variety to the sound. Above all, the meeting of minds between the two Marks–Weinstein %26 Levine–has produced a program of both variety and balance. It is great to hear compositions by Gillespie, Monk, Wayne Shorter, Mulgrew Miller and Bobby Hutcherson. The Coltrane piece, “Crescent,” even though one of his Impulse! albums is named after it, is one of his lesser known, and it is great to hear it revived; it shares a prayer-like quality with “Lonnie’s Lament,” recently recorded by Anat Cohen on her Poetica album. Along with these pieces, originals by Weinstein, “Broadway Local,” Levine, “La Coneja Loca,” and Debriano, “Santi’s Africaleidescope,” fit happily alongside the jazz classics–sufficient praise in itself. As an amateur, Weinstein probably loses money on these projects; I know he is often out-of-pocket after many of his own gigs. But there is no need for him to lose too much, so run out (actually go online) and buy this as soon as possible!